The contribution of digital channels like website, social media, email, etc. is quite remarkable to the sustenance and growth of any nonprofit. From garnering support from volunteers and donors to reaching out to the target beneficiary cohort, they make the path remarkably easier for nonprofits. However, change is the only constant, and like other entities, nonprofits too have to adapt to it, to keep the merry going round. In fact, these cool technology derivatives serve as a brand ambassador for the today’s nonprofits. However, with the evolving digital behavior of consumers, there is a dire need that nonprofits evolve their brand communication and marketing strategy. Today, let’s find out how the much-hyped AI (Artificial Intelligence) chatbot, or so-called the talking bot, can make a difference to their functioning and success. What are chatbots? If you are eager to find the answer, read What are Chatbots and What They Can Do for Your Business. Gaining the attention of the target audience is of key importance for any nonprofit, but their hectic lifestyle and abundance of too much digital content emerges as a key challenge. When I was a kid, I do remember, how worried my parents were regarding my poor attention on subjects like mathematics. Today, citing the declining attention span of kids, I feel I was blessed; in fact, I had a better attention span. A report on the issue by Microsoft depicts a sensational fact: attention span had fallen sharply from 12 seconds in 2000 to 8 seconds in 2015. So we are poor than a goldfish that has an attention span of 9 seconds. This is really challenging for nonprofits. It’s a barrier to getting the desired attention to their causes through digital marketing campaigns, including paid, affiliate, or organic. Chatbot integration with a fundraising app or website is the wise solution to overcome it, believe industry AI experts. There is so much to read on the web that people find it really difficult to stick to one piece of information claim Dr. Ziming Liu of San Jose University. So being a nonprofit no matter how well you have created your digital communication until you make users stop by and listen to you attentively, it’s not going to pay off. Chatbot has two pros in this regard. First, chatbots are relatively new in the industry and the curiosity-driven users are most likely to interact with it. Second, chatbot presents an interactive medium that users love. Effective communication is pivotal for getting the attention and support of the audience. AI chatbot development and integration makes a breakthrough attempt in this regard. Imagine yourself as a teacher conducting a class. You put a good deal of efforts in teaching a lesson because you wanted to do justice to your job. What, if students are not reciprocating your questions? Will your hard effort serve the purpose? Likewise, no matter what you pitch through your cause-awareness and fundraising app until your message resonates well with the audience, evokes the emotion and sparks the urge. But it’s easier said than done. Before making any donation, the user would be interested in knowing who you are and what you do. This can be done with a team of people, but that will be a costly proposal as you have to pay them. And, it’s also not possible to answer every question by means of FAQs on your websites. What happens when users don’t get answers on time? So the battle is lost. Here is how chatbot can make a difference. One single chatbot can be made to respond to the unlimited number of queries raised by hundreds and thousands of users, and that too sensitively and relevantly, provided you build a chatbot wisely. Judicious use of the fund is of paramount importance at every step. See how chatbots can bring sensational reform to the functioning of your nonprofit helping you reduce the operating cost while optimizing the outputs. Human resource, infrastructure, technology -- there are so many areas, where you have to invest before you make your nonprofit organization functional. Some are recurring in nature, while some are not. But it’s certain that the cost of operating will go up with time. If you are on a thin budget, the rising costs may pose a severe challenge. So it’s imperative to think of ways to cut down the operating cost, but without sacrificing the efficiency of your people, and diluting the very objectives of your nonprofit. Making the chatbot an integral part of your digital marketing initiatives, cause-awareness, and fundraising campaigns, you can drastically curtail the operating budget. A fully-featured chatbot built with the latest artificial intelligence platforms and SDKs like IBM WATSON/ API.AI / Slack SDK / Skype SDK / WIT.AI, Alexa, etc. can make you respond to a huge volume of queries at a time. While talking with a human, you have to be a human, if you really want to elicit the intended actions, otherwise, the choice is yours. IVRs (Interactive Voice Response System), Auto-Respondent, Voice Assistant and so on -- we have been part of all this evolution. Indeed, they make your processes and operations cheaper and help in handling the large volume of queries, but they hardly bring in the human-touch in the conversation that is essential in striking a bond with the audience. Chatbots integration can let you have an upper hand in this context when designed and coded intelligently. Remember, the AI chatbot has to simulate the attributes of human intelligence, including reasoning, knowledge, planning, perceptions, interpretation, etc., then only, you can expect it to reciprocate to your donors or volunteers intelligently. So the choice of technology partner matters a lot. You don’t need just a mobile app developer but someone who understands and is adept at bridging AI with the human intelligence. Considering of starting a nonprofit organization? Worried about the cost of fundraising software for nonprofits? There are good reasons to keep your fingers crossed with artificial intelligence in place. First, Chatbot developers can leverage existing instant messaging tools like Facebook Messenger, Skype to facilitate the service. There are free SDKs available for chatbot development. We have named a few above while talking about reducing the operating cost in Step 3. Chatbot can be integrated easily with your existing web or mobile app. So you don’t have to retire your existing fundraising app. The game of imperialism continues for nonprofits because everyone has an ambition, but for good reasons. The momentum gained with the adoption of Internet communication channels and mobile apps is likely to go much farther with chatbots. Everyone wants growth. Perhaps, this desire makes what’s called Life. But to reach out to and support more people and their causes, and raise more funds, you need to toil hard in terms of recruiting new volunteers, setting up new offices, and striking a chord with people you serve, and collaborating with people who share your vision. 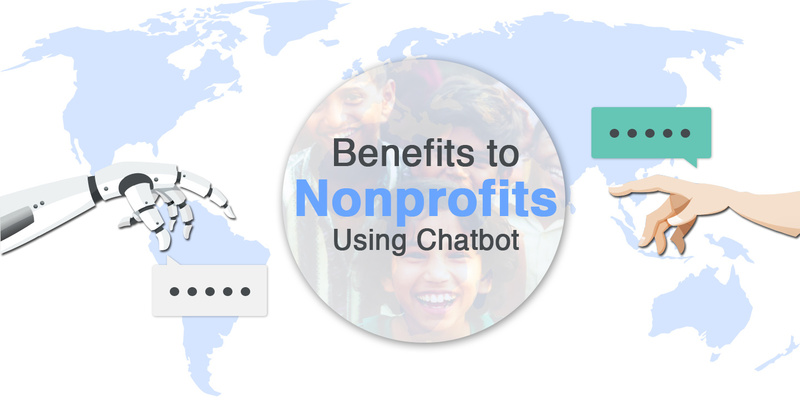 With their cross-platform (Google Assistant, Slack, Cortana, Alexa and Facebook Messenger) and cross-device (smartphone, tablet, wearable, car, and other smart devices) compatibility, and multi-language support, chatbots make it easier for nonprofits to push their limits and make the impact while staying profitable. Conclusion: We recommend you not to get swayed away by the unnecessary hype created by some low profile chatbot development companies. Technology vendors with little competency on chatbot development and integration, often ask their clients to pay more in lieu of making the chatbot technology compatible with their existing web or mobile application. Also, only software programming skills are not enough in terms of chatbot development. The concerned developers must have a sound understanding of NLP (Neuro-linguistic programming) and machine learning as that help building a cognitive AI chatbot that doesn’t lose the contextual-relevancy while talking to users.